February 7, 2019 -- Philips Healthcare has launched a new premium ultrasound scanner family called Epiq Elite for general imaging and ob/gyn applications. The scanner comes in two flavors: Epiq Elite for General Imaging is tailored to the specific needs of vascular assessment, while Epiq Elite for Obstetrics & Gynecology is designed to provide excellent image quality and lifelike 3D scans for better fetal assessment at all stages of pregnancy, according to the company. The platform includes the company's Ultimate Ultrasound Solution for Vascular Assessment package, which gives users insight into the progression of vascular disease by combining 3D and 4D imaging. It also offers a simplified workflow and complementary clinical tools to monitor and assess vascular disease, Philips said. Philips' TrueVue technology enables clinicians to manipulate a virtual light source around 3D fetal images to produce lifelike images. Image courtesy of Philips. Using the company's xMatrix transducers, users can acquire 3D vascular images that enable clinicians to easily visualize vessels directly and evaluate the spatial location and composition of plaque. The scanner also includes a live xPlane imaging mode that allows clinicians to acquire two planes simultaneously for better accuracy in data collection while reducing exam time by 20%. Meanwhile, the Epiq Elite for Obstetrics & Gynecology scanner includes new transducers and software that improve fetal assessment and meet the specific needs of ob/gyn patients, especially during the early stages of pregnancy. For example, V9-2 is a lightweight, ergonomic transducer that is the first high-frequency transducer based on the company's PureWave technology. When used with Philips' TrueVue image processing mode, Epiq Elite allows clinicians to manipulate a virtual light source around 3D fetal images to produce incredibly lifelike results, according to the company. 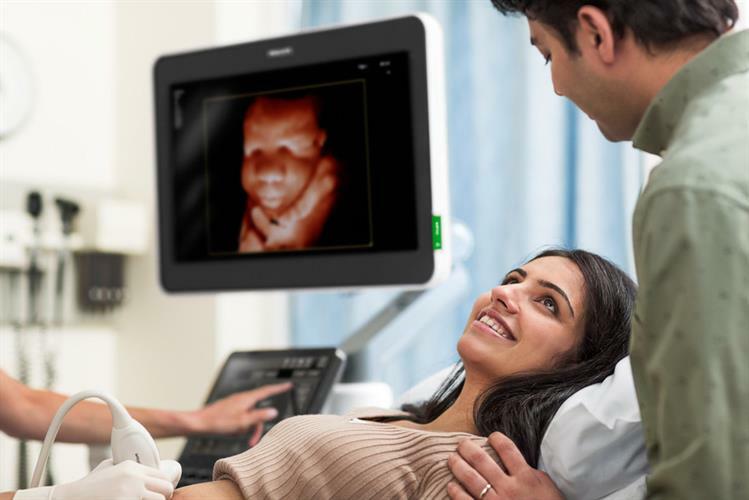 In addition, Philips' aBiometry Assist application uses what Philips calls "anatomical intelligence" to automate the time sonographers spend gathering measurements. This reduces exam time and allows clinicians to spend more time with patients. Philips plans to show Epiq Elite for Obstetrics & Gynecology at the upcoming Society of Maternal-Fetal Medicine (SMFM) conference in Las Vegas, and it will show Epiq Elite for General Imaging at ECR 2019 in Vienna.